The purpose of leaflets and patient information leaflets is to share the necessary information with the users. The format is adapted to the volume of information and the production procedures assure the easy running on packaging lines. Typically thin, recycled or recyclable paper is used. 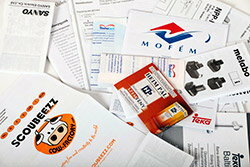 We gained broad experiences in the production of guillotine cut and folded leaflets. We are also ready to provide professional assistance in the selection of the appropriate material, folding method and in trouble-shooting (i.e. difficulties occuring on the packaging line). The production is fully automated and by the means of modern, trouble-free plate processing, the perfect customized equipments, the simultaneous production of more variations – i.e. language mutations and versions complying the country specific legal regulations – is cost effective. Digital printer (laser printer using powder inks) is used to cost effectively print premium quality leaflets, when several variations are ordered, each in low quantity. Our production and quality control procedures exclude the possibility of product mixing and false shippment labelling. Our products meet the extremely strict requirements of the pharmaceutical industry. As a result of the synergy of the modern technology, our PIL supplier experiences and the exceptionally well trained staff, the prices are competitive. Our standard check-list of PILs include 68 control points. Custormer reflections and recommendations are integrated to our framework processes forthwith, and we apply client customized standard procedures which are part of our contractual co-operations.